Let’s Get Everything Inside Ready to Go! With my last post I spent a lot of it dealing with items that relate to motorized RV’s. 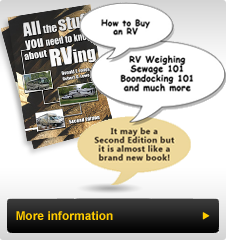 This Blog Posting will cover both motorized and non-motorized RV’s interior systems. So far we have checked the exterior integrity, tires, some exterior safety components and installed the battery(s). Now is a good time to check the LP or Propane system to ensure it is leak free, the containers are current, that the regulator is operating correctly and that the LP detector is operating. Some of these checks should be done by a LP or RV dealer, although checking the detector can be done by holding an unlit cigarette lighter near the detector sensor and briefly holding the lighter open to discharge some gas, which should cause the detector to sound. If not then check the sensor for an issue, and correct it. Turn on the shut off valve and with a properly functioning LP system, light the stove to purge the air from the system. Before lighting the water heater, furnace or refrigerator, remove any sealing materials placed over the inlet/outlet areas and access panels. Check to be sure there are no mice, bird’s nests or bee and/or wasp nests in these areas. With all cleared to operate turn on the refrigerator and let it start on LP. It may need to cycle a few times to purge the air from the lines, however it should start up if it functioned properly when you put it into storage. Next, try to operate the LP furnace. Turn on the power to it and raise the temperature above the ambient temperature. It also make take a few cycles of the fan starting and trying to start before it starts. Once operating, let it run and set the temperature to a comfortable level, ensuring that the furnace cycles as it should. The last LP appliance to light is the water heater however it requires water to be in the tank unit before lighting (or turning on the electric element). Add water to the RV Fresh water tank and then run the pump while flushing out the RV winter antifreeze. I usually start at the fixture farthest from the pump, ensuring that all taps are turned off (including the drain valves), and making sure that the water heater bypass valves have been returned to normal flow. Ensure that the drain plug (and/or anode) has been re-installed correctly and the metal pressure relief valve near the top of the heater has been closed. Let the system fill the water tank and ensure all the antifreeze and air is out of the system. Check that the toilet(s) have water to them as well. It is a good idea to chlorinate the system following the recommended process although that can be done after the water heater operation has been confirmed. Try to light the water heater, by cycling the switch to activate it on and off. If the light in the switch lights (indicating no ignition) then turn it off and restart it again. After a few attempts you should hear the heater running and the light in the activation switch will not be on. Allow it to run long enough to cycle off.